The International Organization for Migration (IOM) has played a major role in humanitarian shelter operations for many decades. 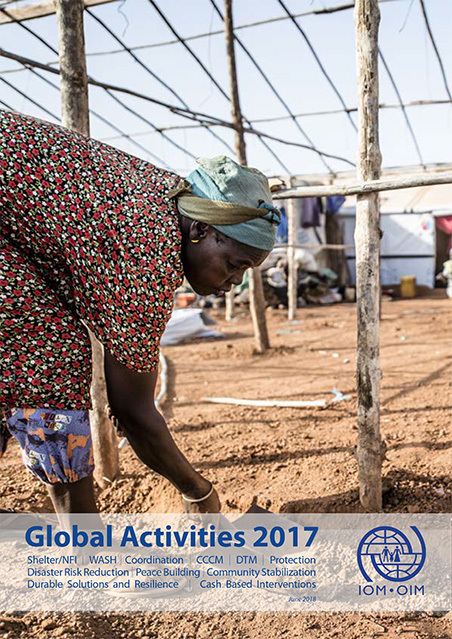 IOM’s unique position as an intergovernmental organization allows it to work at scale in both natural disasters and conflict/complex contexts. IOM works in both operations and coordination, and plays a strong role working with partners in support of national authorities. IOM’s overall objectives are (1) to focus on quality and scale of operations, (2) to be people-centred and context driven, (3) to continue supporting interagency shelter coordination, (4) to support sectoral learning and identification of best practices, and (3) to maintain a longer term view. For more on IOMs approach to shelter see the emergency manual (https://emergencymanual.iom.int/entry/40469/shelter-and-nfi). Over the course of 2017, IOM’s Shelter and Non-Food Item (NFI) programmes reached over 5.2 million crisis-affected individuals – nearly 1 million households – in 49 countries, meaning that it supported one-third of people assisted by the Global Shelter Cluster. More than 950,000 households were assisted with core NFIs and 26,808 households benefited from cash-based interventions (CBIs). A further 53,400 families were provided with or supported to build shelters. Also, 53,400 shelters were repaired and 11,231 individuals received shelter trainings. IOM continues to maintain a strong role in support of the Global Shelter Cluster and operational shelter coordination. At country level in 2017, IOM had a significant coordination role in 25 shelter country coordination mechanisms – ranging from national leadership in shelter cluster coordination to subnational coordination or technical and information management (IM) support roles. Globally, IOM is a key player in the Strategic Advisory Group within the Global Shelter Cluster, and co-leads the Shelter Projects (www.shelterprojects.org) and the GBV in Shelter Programming (www.sheltercluster.org/gbv) Working Groups. During the 101st session of the IOM Council, IOM's 149 Member States adopted the Migration Crisis Operational Framework (MCOF), a framework which highlights Shelter and NFI response as a core component of this framework. To learn more about IOM shelter and NFI activities, as well as other areas of humanitarian assistance, please visit the Operations section of IOM’s Emergency Operations Manual. *Click here to access the latest IOM Shelter Update.